Congratulations Josh Mitchell. 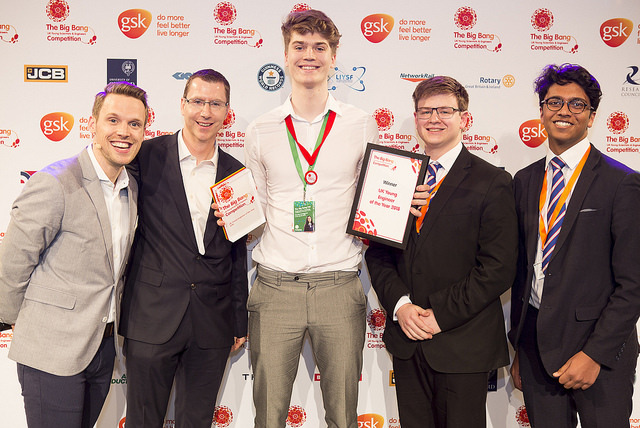 The 18-year-old student from Holmes Chapel Comprehensive School in Cheshire has been awarded the UK Young Engineer of the Year title at The Big Bang UK Young Scientists & Engineers Competition for his ground-breaking project addressing the development of an affordable 3D printer prototype: ‘The Plybot’. Through his project, Josh aimed to prove that it was possible to build a 3D printer for a fraction of the commercial cost, which was easy to assemble at home, and didn’t compromise on print quality. His final creation, which fits inside two 13-inch pizza boxes (unassembled), snaps together using just 18 bolts and produces print-quality that was indistinguishable from commercial printers, costs £49.